Jackie Chan, Chinese and Holly-wood superstar, will come back to Cambodia soon to shoot an action film with scenes at Angkor Wat, said Deputy Prime Minister Sok An on Wednesday. 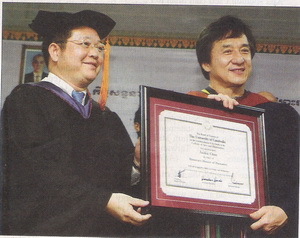 The confirmation comes Jackie Chan met with Sok An on Wednesday at the Council of Ministers. “Cambodia has many heritage sites and Cambodia has been successful in protecting its heritages,” Sok An said. Jackie Chan, a keen philanthropist, a UNICEF/ UNAIDS Goodwill ambassador and international film superstar arrived in Cambodia on Tuesday. Jackie Chan joined a singing ceremony with famous Khmer singers, including Preab Sovath, Meng Keo Pich Chenda and Hoem Sivorn, at the South East Asia Television (SEATV) station from 4-6 pm yesterday. Hundreds of students and supporters crowded the area. Jackie Chan is a Hong Kong actor, action choreographer, filmmaker, producer, martial artist, screenwriter, entrepreneur, singer and stunt performer who has appeared in over 100 films, press release said, adding that Jackie Chan is a keen philanthropist and a UNICEF/ UNAIDS Goodwill Ambassador, having worked tirelessly to champion charitable works and causes. He has campaigned for conservation, against animal abuse and has promoted disaster relief efforts.